The word baroque is derived from the Portuguese word Barroco which means an unevenly or an odd shaped pearl. The period came into being in the 1600. It flourished in Italy and extended its roots in most of Europe . Baroque describes a period of art and style which symbolizes great dramatism , exaggeration , emotion , exuberance etc. The Baroque period overawed simply by its grandeur. 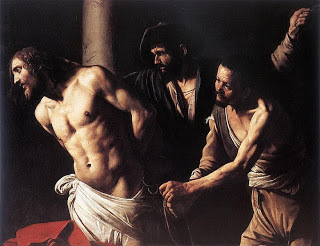 The Flagellation of Christ by Caravaggio 1607 is a best example of Tenebrism art . ART AND ARCHITECTURE : The catholic church marked the start of the baroque style art . The church wanted their religious paintings to portrayed with exaggerated emotion and more of drama . The style became famous because it bought in more life and movement to the paintings , sculptures ,ceilings etc.Techniques like “ Tenebrism “ which literally means “ night pictures “ or pictures painted “ in the dark” i.e the subject used had the only source of light and was painted against a black colour . Judith beheading holofrenes is the best example of Chiaroscuro art. Another technique that became popular was “Chiaroscuro” which meant the play of light and dark colour’s in a painting .The Baroque architecture was designed to create illusion. Unlike the art in the renaissance the baroque art introduced flowing curves, enlarged domes, interiors that spectacularly spotted effects of light and shade etc. Gianlorenzo Bernini, Andrea Pozzo , Caravaggio were some of the known artists of the baroque period . FASHION AND CLOTHING : Women clothing :The western European fashion was characterized by the disappearing ruffs which were replaced by linen collars or broad laces . The silhouettes unlike in the 1615 broadened and softened gradually. The clothing became less restricted for women specially. The skirts were layered and padded at the hip to produce a fully flowing look. 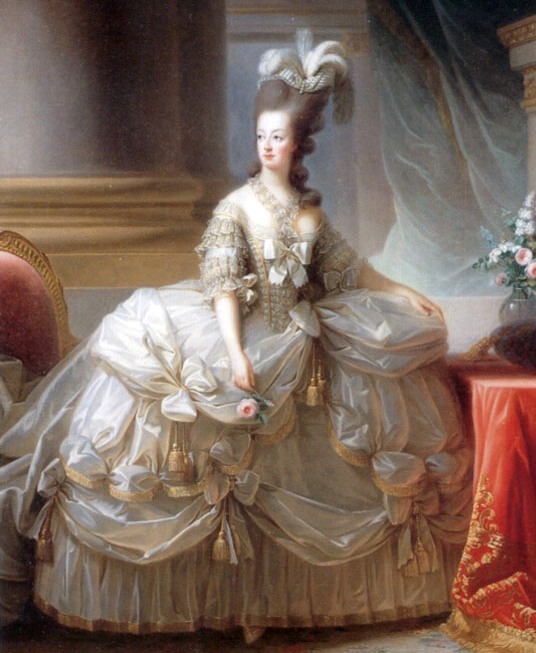 Two types of skirts were usually worn ; the overskirt which was opened in the front and an underskirt . Sleeves were larger and loose gathered at the wrist with lace cuffs which turned backwards . High waistline was the fashion and pointed stomachers made a come back . Fabrics used mostly consisted of solid colour brocades, Other decorations included laces , pearl jewelry etc. Women wore their hair in tight curls at the forehead and on both sides of the head, called “heartbreakers,”. Face patches were made of silk and velvet which became really popular . women kept their cheeks and lips roughed . Men clothing : the fashion for men was more elaborate than women. 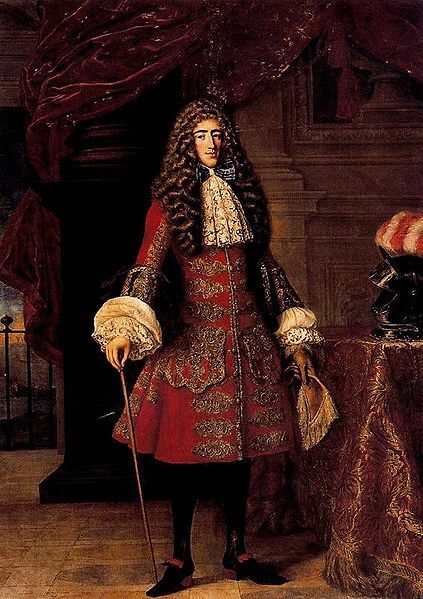 Tall ruffs were laid down to flat collars, The breeches became closely fitted or were buckled at the knee and was worn with a hose underneath it . Long jactes with folded sleeves , high knee boots, capes , wide brimeed hats were the everyday clothing essentials .Embellishments like lace and embroidery were used to elaborate a men’s garment. Periwig also became an important element for mens fashion. 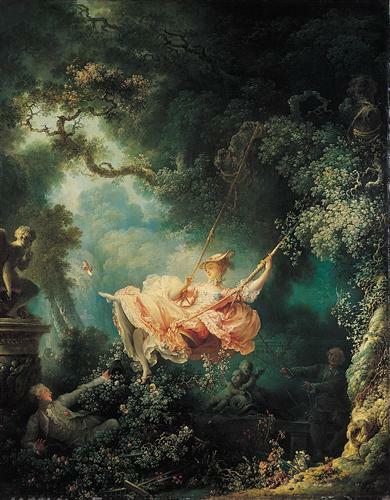 The Happy Accidents of the Swing, this painting is considered one of the great master works of the Rococo era. The picture depicts a young woman on a tree swing, being pushed by her husband. Neoclassicism came into being around the 1700 A.D .It meant “ New and trying to make classic”. The themes were inspired from Greece and Rome. Heroic, moral themes in classical history were used to inspire the cause of French revolution. The sense of purpose was serious subjects. Greek classical themes were also commonly used. Then came in Romanticism around 1800 A.D . The drama , struggle and emotion of Romanticism replaced the calm, order and sense of purpose of Neoclassicism. FASHION IN THE PERIOD: Fashion magazines emerged because people gained fashion influence and wanted to stay intune with fashion. Embroided patterns, rich ornamentation , rich fabrics were used throughout the period. Quilted Padded skirts , hooped peticoats were worn by woman . Corsets were also worn which made the woman look feminine. Floral patterns became popular , pastel colors were preffered over dark colors . Necklines were usually deep and plunging. Hair was worn tight and was pinned into a bun . Wigs were worn which were usually decorated with flowers, ribbons etc. History of europeanfashion.wordpress.com, (2012). Baroque/Rococo 1650-1800 | History of Costume. [online] Available at: https://historyofeuropeanfashion.wordpress.com/category/baroquerococo-1650-1800/ [Accessed 18 Jan. 2015]. The Seventeenth Century Lady, (2013). The Difference Between Baroque & Rococo Art. [online] Available at: http://www.andreazuvich.com/art/the-difference-between-baroque-rococo-art/ [Accessed 18 Jan. 2015]. Wikipedia, (n.d.). Christ at the Column (Caravaggio). [online] Available at: http://en.wikipedia.org/wiki/Christ_at_the_Column_(Caravaggio) [Accessed 18 Jan. 2015]. Wikipedia, (2014). Judith Beheading Holofernes (Caravaggio). 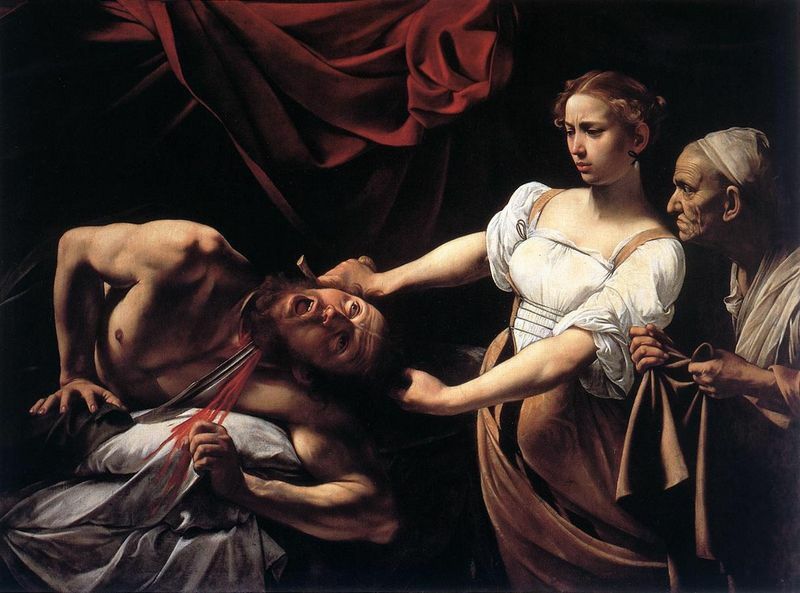 [online] Available at: http://en.wikipedia.org/wiki/Judith_Beheading_Holofernes_(Caravaggio) [Accessed 18 Jan. 2015]. Historyofeuropeanfashion.wordpress.com, (2012). Baroque/Rococo 1650-1800 | History of Costume. [online] Available at: https://historyofeuropeanfashion.wordpress.com/category/baroquerococo-1650-1800/ [Accessed 18 Jan. 2015]. Wikipedia, (2014). The Swing (painting). [online] Available at: http://en.wikipedia.org/wiki/The_Swing_(painting) [Accessed 18 Jan. 2015]. ← “Every man dies ; Not every man really lives ! !